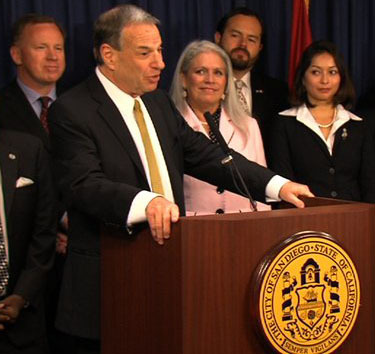 San Diego Politico: The Era of Democratic Conciliation is Over? I think I’m ODing on Schadenfreude. These past few weeks have had me just in awe in the response of the Downtown Powers-that-be over Mayor Bob Filner’s actions in vetoing the Port and the failure to override, especially the U-T’s editorial. I don’t which I love more. The fact that Bob is exercising the power given to him by the strong mayor position that the Powers-that-be backed or the fact that they thought Democrat that would eventually be elected Mayor would be someone that would follow the unwritten rule that you never, ever, mess around with Downtown and the Downtown interests. That was always the rules if you were Democrat that wanted electoral success in San Diego. You would either kow-tow to the Powers-that-be and be allowed to do some of your pet projects with the knowledge that when the time came you would support them in some project that they needed to build up Downtown or the Convention Center. Then they would support you when you ran for some office either in Washington or Sacramento. Eventually a Democrat would be elected Mayor so the powers-that-be hopes were that it would be a go-along-get-along Dem that they loved dealing with like a Tony Young or a Todd Gloria. I mean the recent Port vote reeked of the typical go-along-get-along deals that permeated for years in the Council. But I think the Mayor and some of the City Council have done the math and made the conclusion that with a Democrat being elected in the Fourth District later this year that the Era of Democratic Conciliation is Over and that Democrats must be the voice of those who see San Diego as more than just a Convention Center and an Embarcadero. That there are communities north of Laurel St, east of 16th St and south of Imperial Ave.
And I think this message will resonate as long as the Mayor and some on the Council continue in the strong resolve that they have been showing. And watching the Powers-that-be flip out is just a huge bonus.